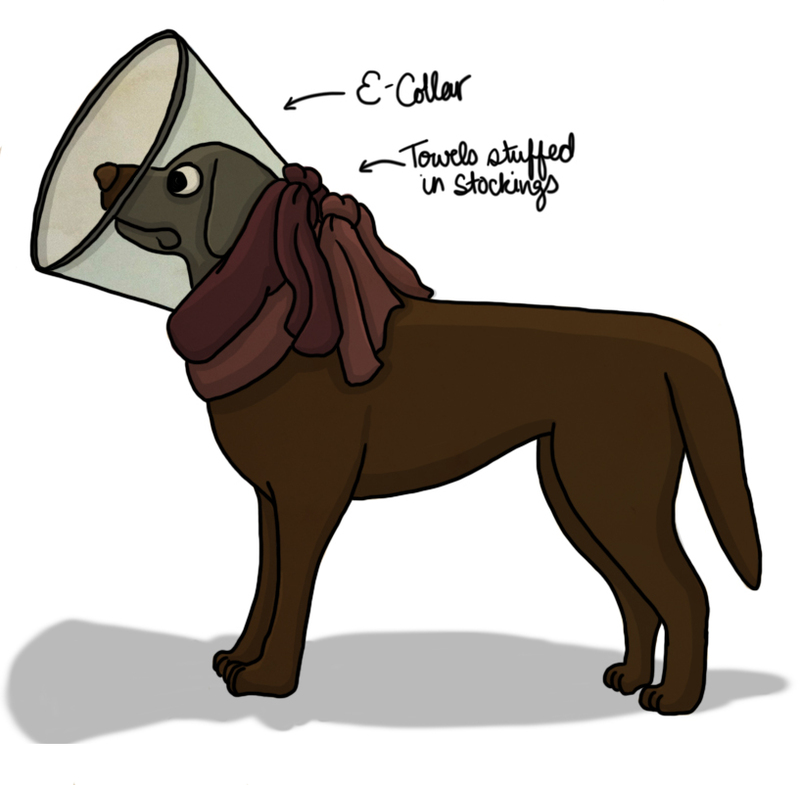 Finnegan (our Chocolate Lab) in his E-Collar/Cone of Shame with two towels tied around his neck. We tried EVERYTHING. (Except one guy online who suggested building a brace out of PVC pipes... but that did have some good points). We tried the cone of shame. We tried putting pants on him. We tried just stopping him when he went to lick. We tried keeping him quiet (HAHAHAH. Fail.) We tried tying towels stuffed into stockings around his neck. We tried the cone of shame plus two towels plus pants (all tied to each other in a weird body suit) plus lying beside him to physically stop him from licking PLUS his leash PLUS the crate and STILL he ripped out all of his stitches. I think when I watched him wriggle backwards through the grass, writhing and looking at me like I'M the jerk that ripped open his stitches, while moving around like a lunatic and filling his gaping wound with grass and dirt... I gave up. Our vet said that if they (animals) want to get at something badly enough, they will find a way. He told us a story about a horse who got castrated who straddled some young evergreen trees to get his stitches out. (That DID kind of make me feel better). We googled what other people have done who had this problem, but nobody had a foolproof solution. Most of the discussion was about softer alternatives to the cone of shame. Not. Helpful. It's been a rough week. It's hard to see something you love be bleeding, in pain, and miserable. He was such a trooper, too, despite bleeding for four days straight. But he was also a jerk and it was hard to say at times wether I was crying because I was frustrated or because I just felt so bad for him. Mostly it was both. We go back to get new stitches PLUS staples this morning. Despite all that's happened so far, I feel hopeful that this time it will work! Lots of the swelling and irritations from before are gone now, and he'll have the stitches AND the staples, and we are now well prepared with Cones of Shame (which we are going to build out with a second cone or plastic), towel-stuffed stockings, and enticing bones to distract him with. Wish us luck! Or even just patience. I'll take whatever I can get.